A very private three-bedroomed house with extensive gardens leading to a swimming pool area with small pool house. Located amongst mature almond, carob, olive and orange trees. Overlooking traditional countryside of low hills, orchards and sea views, very close to a selection of beautiful beaches and two golf courses. This two-storey villa has comfortable and airy rooms with a dining area and fireplace, that leads on to a spacious living room and a large fitted kitchen. The living room has French windows leading out on to a large terrace with a pergola and outdoor dining area. The inviting swimming pool can be seen from this terrace and grassed area. Casa Almargem provides a wireless internet connection. A private, quiet and welcoming environment that is perfect for couples or families. Casa Almargem sleeps 6 people in comfortable beds with quality bedding and provides all linen, towels and beach towels, for use in the villa. The comfortable lounge has a double sofa and chaisse longe sofa, local television and DVD player. The dining room has a large wooden table and seating for 6. There is access to a cloakroom with toilet and washbasin from the dining room. There are lovely views onto the lawn and pool area from the lounge. All rooms have air conditioning for cooling and heating purposes. This is included in the weekly rates. The kitchen is fully equipped with a gas hob and electric oven, microwave, dishwasher, kettle, toaster, fruit press, coffee machine, fridge-freezer and washing machine. The upstairs bedroom has a double bed and is en-suite with a toilet, sink, bidet and bath with shower. A Juliette balcony affords views over the pool area and sea views. A roof terrace is reached from the top of the stairs, by the master bedroom and has sea and mountain views. The downstairs bedrooms comprise one double bed and two single beds, built in cupboards and french doors with mosquito nets and shutters both leading out to the garden. There is a bathroom with a bath and shower, sink and toilet on the ground floor between the two bedrooms. Teak table and chairs, with seating for six is provided outside under the pergola for exterior dining. Six quality sunbeds, sun parasols, and table and chairs are provided around the pool terrace and pool house. Casa Almargem has an 8m x 4 m swimming pool with steps leading into a shallow end of 1.20m and a deep end of 2 m. Freshwater pool with Chlorine cleaning system. There is a separate indoor area with bathroom at one end of the pool. The pool is serviced twice weekly during summer and once weekly during the rest of the year by a competent and reliable professional. Pool and garden lighting is available. This property lies within the boundaries of the Ria Formosa nature reserve, it is located off a ‘no through ’ road and so has no passing traffic. There is a local railway line approximately 300m further south. The property is approached along a quiet country lane, is fenced and has a gated entrance, car parking is provided by the house. The garden around the house and the pathways are lit. Supermarkets are approximately 5 minutes away from the property, on the road towards Tavira and mini-supermarkets are located in equidistance in Cabanas. Praia da Cabanas and Ilha da Tavira are the closest beaches, within 7 minutes drive and 5 minutes river crossing to the Island. Manta Rota beach is reached by car without a river crossing and is located within 10 minutes driving. A car is recommended, especially in the heat of summer…and for reaching all the beautiful and interesting places further afield. This is a great location for biking and walking, with the ECO VIA pedestrian and cycle path just metres away. Car rental, taxi transfers and bicycle hire can be organized with local reputable firms in advance or by calling the local representative. For more elderly visitors, on the ground floor there is a twin and double bedroom, a bathroom and WC, all level but for just one step. Several steps lead to the front door but access to the villa is also possible from the back, up the garden path. The lay-out is easy, spacious and very accessible. There are a few houses dotted around the fields and groves in this area, the nearest being approximately 100 metres from the house but situated so that neither overlooks the other. Arrivals are flexible, though we aim to keep bookings as close as possible. Departure is by 10am and arrival is from 2pm unless otherwise arranged. We provide a once weekly linen and bathroom towel change including a clean of the bathrooms. During longer winter lets cleaning and linen changes are agreed on an individual basis. There will be some toilet paper and soap for arrivals and a hamper of beverages, with additional breakfast and snacks provided for late arrivals. Bathrooms with two bath tubs with shower appliances. One toilet and one bathroom on groundfloor. Outdoor bathroom by pool. 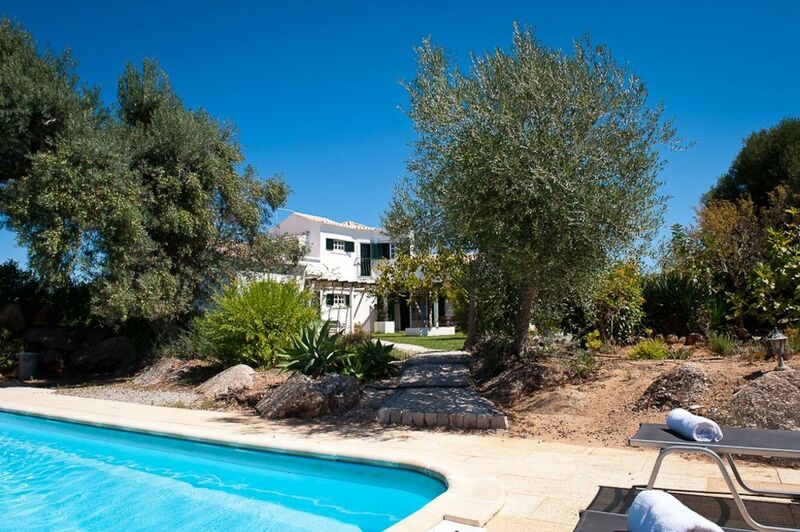 Casa Almargem is set within 5000m2 of mature gardens, dotted with fig, lemon, orange and palm trees. There is a partially covered terrace in front of the kitchen and living room, which faces the pool area and is bordered by Bougainvillea. There are excellent golf courses within 5 to 10 minutes drive from the accommodation. The closest are Benamor, Quinta da Ria and Quinta da Cima, Monte Rei. We had a wonderful, relaxing time. Beautiful area and all we could want! Tavira and the villa was perfect. The Jacaranda people go the extra mile to ensure all is correct and nothing is too much trouble. Will definitely return sooner rather than later and thoroughly recommended. Many thanks, for your feedback, we are very please that you enjoyed your stay at casa Almargem. Jacaranda Holidays and sunny Portugal await your return! The beach of Cabanas is 2 kms away. Breathtakingly beautiful new golf courses are just 1km away at the end of the road!! Close to the Via Verde cycling and footpath trails that link places of natural, protected beauty and local towns. Quinta da Ria, Quinta da Cima and Benamor and Monte Rei courses all between 5 and 10 minutes away. Other activities include , fishing, sailing, bird watching, cycling and walking. Golf: There are excellent golf courses within 5 to 10 minutes drive from the accommodation. The closest are Benamor, Quinta da Ria and Quinta da Cima, Monte Rei. Property will be inspected prior to arrival and departure and all breakages must be refunded in full - breakage deposit will be refunded within one week of departure. Changeover Day : flexible Arrivals after 1pm and departures by 10 am however, we can make exceptions. Internet access can be provided on request, paid locally by charging pen drive; 1 euro per hour.